Provide comfort for the family of Marguerite (Bunny) DeTro with a meaningful gesture of sympathy. On Friday, December 21, 2018, Bunny DeTro went to be with Jesus, while residing at Avalon Care Center in Spokane, WA. She was born Marguerite May Lambert (but her brother named her Bunny) on May 31, 1924 to Herbert and Nellie (Deller) Lambert in Gravenhurst, Ontario, Canada. She joined her sister Eva and brother Vernon Lambert and grew up in the Gravenhurst and Toronto, Canada areas. 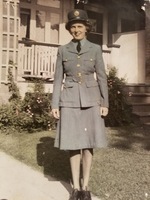 When WWII started, she joined the Women’s Division of the Royal Canadian Air Force. She was an Aero Rigger and Fabric Worker, patched airplanes and later made Anti-Blackout Suits for the pilots fighting in WWII. She was transferred to Toronto in September 1945 where she met Russel DeTro, also with the RCAF. After a crazy whirlwind courtship, they married on December 14, 1945. After the War was over, they traveled by train to British Columbia, Canada where Russel’s folks picked them up and took them to their new home in Riverside, WA on February 9, 1946. There they started the next phase of their life together. Bunny, Russ, Mom & Pop DeTro opened a new store in the former Blackwell, Lee Frank building known as H. DeTro & Son. As years passed it became DeTro’s Country Mercantile, then DeTro’s Western Store where they worked together for over 40 years. Each of their three children worked there as well. Russ and Bunny lived in an apartment above the store and while living there, their 3 children were born. Virginia Dale (Ginger), James Gordon, and Walter Scott. While living in Riverside Bunny made sure her children kept active by helping start many different organizations in Riverside. Bunny was a leader in Blue Birds, Campfire, Cub Scouts, 4H and helped organize the Riverside Ghost Riders Riding Club. She also organized several women in Riverside to help make the original chaps, breast collars and bridles for the Riverside Ghost Riders. They had a production line setup in the back of DeTro’s Store. She was active with the Riverside Methodist Church and worked with the youth there. She and Lorraine Green taught square dancing at the Riverside School on Friday nights and many kids from Omak came and joined in. In 1964 Ginger became Omak Stampede Queen and she and Russ were the chaperones on many occasions. This opened a whole new adventure for Bunny. She became involved with the Omak Stampede as a chaperone, and it wasn’t long before she was selected as member of the Board of Directors. She was the first woman on the Board, where she was later elected to the Omak Stampede Hall of Fame. She was also recognized as a woman committee person in the PRCA, and held a PRCA Gold Card. She approached the Stampede Board with the idea of building a Museum and she worked for years to get that job done. On August 7, 2017 she saw her dream come true when they built the Omak Stampede Museum and dedicated it to her. Bunny and Russ were able to take many trips to the Holy Lands and Hawaii. They dedicated years of service to both the Riverside Methodist Church and the Omak Presbyterian Church, where she worked as secretary for many years. Their walk with Christ touched many lives and gathered an abundance of new friends. After DeTro’s store was sold in 1986, Bunny and Russ moved to Omak. She and Russ volunteered at the Omak Visitors Center for many years. 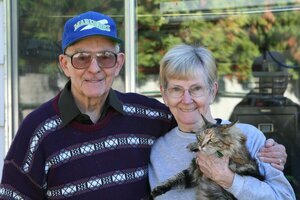 As Russ’s health declined, they retired from the Visitors Center and she devoted several years to caring for him at home. There she was able to have a beautiful rose garden and started oil painting. She was a member of the Okanogan County Art Club, and entered many beautiful paintings in the County Fair, and was also selected as Artist of the Year. She loved her children, grandchildren, great-grandchildren and in September 2018 she met her 2 great-great-grandchildren and a 5-generation picture was taken. She was very proud of all of them and their accomplishments in life. Bunny was preceded in death by her parents, sister & brother, and husband, Russ. She is survived by her daughter, Ginger Morrison (Tom), Deer Park, WA, sons Jim DeTro (Patty) Tonasket, Scott DeTro (Phyllis) Omak, sister-in-law, Kari Lambert, Huntsville, AL, grandchildren: Doug DeTro, Tammy Hansen (Jeff), Victor Morrison(Marcy), Diana Soliday (Brad) and Ashley Goetz(Bryon), as well as 14 great-grandchildren and 2 great-great-grandchildren. A special thank you to the staff at Avalon Care Center in Spokane for their loving care of Bunny these last few months. Graveside service will be held at the Riverside Cemetery, Riverside, WA on Saturday, January 19, 2019 at 11:00 am. . A reception for family and friends will be held at the Omak Elks Lodge following the graveside service. In lieu of flowers, memorials in Bunny’s name can be made to The Omak Stampede Museum, P.O. Box 1340, Omak, WA. 98841 or to the charity of your choice. To send flowers in memory of Marguerite (Bunny) DeTro, please visit our Heartfelt Sympathies Store. We encourage you to share your most beloved memories of Marguerite (Bunny) here, so that the family and other loved ones can always see it. You can upload cherished photographs, or share your favorite stories, and can even comment on those shared by others. Provide comfort for the family of Marguerite (Bunny) DeTro by sending flowers.